Qiang Liao, senior director at S&P Global Ratings, sees difficult days ahead for the country's banking sector. 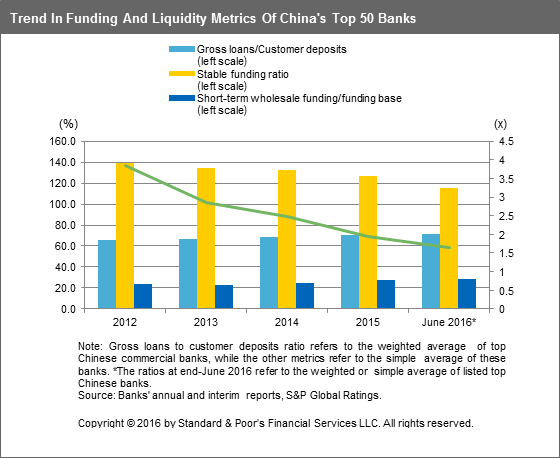 Are China’s largest banks reducing their asset exposures? No. Although credit losses are shooting up and interest spreads are narrowing, our latest survey of China's top 50 banks by asset size shows asset expansion remains a key theme for the vast majority of players. Total reported assets for the top 50 grew by 14.75% in 2015, compared with 13.48% growth in 2014 and 11.76% in 2013. The growth was particularly strong among national and regional banks, which have rapidly grown their interbank and wealth management businesses. As a result, market share has continued to shift toward smaller banks from megabanks. Have banks’ credit losses peaked yet? No. It's no surprise that the top 50 banks' credit losses shot up in 2015 as asset quality continued to deteriorate. The top banks' average ratio of credit loss provisions to average loan balance (or CLPR) increased to 114 bps in 2015 from 85 bps in 2014. There could be a long way to go before credit losses reach their peak, given China's economic growth trajectory and significant industrial supply glut, particularly in the upstream industries. Indeed, we expect the sector's CLPR rate to move up to 150 bps in 2016. Diminishing capital buffers have already led us to take a string of negative rating actions on Chinese banks since early 2015. What do widening credit losses mean for performance? We think there is little respite in sight from the likely significant slump in profitability and squeezed margins. 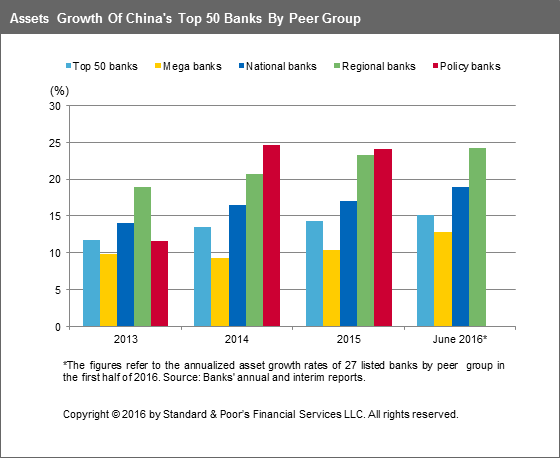 Indeed, we believe that China's top 50 banks are set to enter a new chapter characterized by sluggish growth and lackluster performances. This is because credit losses have nowhere to go but up during a period of rising corporate bond defaults, latent credit risks, and the regulatory push for precautionary credit loss reserving. China’s megabanks could be better positioned than most of their smaller peers, thanks mainly to their more benign credit costs, superior funding costs, and significant edge in cost efficiency. Have funding and liquidity buffers worsened? Yes. While asset expansion has offered temporary relief for bank earnings, it has also exposed them to latent credit risks and heightened liquidity and contagion risks. Strong credit growth and a reverse to capital outflows in recent years have significantly undermined the banks' funding and liquidity buffers when domestic savings have been falling. Although the banks' stable funding ratio and liquidity coverage metrics still compare well with those of global peers', these metrics have deteriorated across the board amid explosive growth in interbank borrowing. Are the banks’ credit profiles also weakening? Yes. Signs of stress are looming. The financial strength of most top 50 banks has weakened compared with last year from a credit rating perspective. Given the banks' reduced funding and liquidity buffers, we see a risk of a sudden bottleneck in credit supply among many of the top 50 banks over the next two or three years. As a result, we expect downward pressure on the banks' credit profiles for the next two years, at least. For a few aggressive banks that are increasingly dependent on wholesale funding, the pressure could be acute, given heightened vulnerability to the risk of a bank run during times of stress. Which banks will be hardest hit? We expect aggressive, but unprepared, players to be hardest hit by the weakening conditions. This is particularly relevant for many regional banks, given their fast growth with limited business diversity and lack of a competitive niche. These banks are pouring funds into corporate lending through receivable investments at a time when China's economic rebalancing and financial liberalization are calling into question the viability of a corporate banking-reliant business model. Further, these banks are vulnerable to regional-wide economic distress due to geographic concentration that could simultaneously hit their asset quality and liquidity. Should these aggressive players be overly leveraged, they are highly likely to run into trouble. Are you worried about the sector’s financial stability? We do not think the worsening trend in most banks' credit performance, profitability, and funding and liquidity pose an immediate threat to the sector's financial stability over the next one or two years. This is because there remains a significant funding buffer in the system, which enables the Chinese government to sustain low interest rates, minimize refinancing risks for most industries, and prop up the economy through infrastructure investment without overstretching liquidity in the banking system. As long as interest rates stay low and refinancing risk is limited, most corporate borrowers should be able to service their debts. This, together with prevalent regulatory capital arbitrage and still good system-wide funding, should enable the majority of top banks to continue reporting adequate financial and credit metrics regardless of the true state of their financial healthiness. How close is a top Chinese bank to failure? The slowing economy and the policymakers' push toward financial liberalization have been subtly but decisively redefining the operating landscape for Chinese banks. The credit surge, together with the interest spread squeeze, is posing all-round challenges for many banks even without a full-blown financial crisis. Although the side-effects could ease the strain on the banks' credit losses in the short term, the trade-off between credit losses and net interest margins would not necessarily favor the banks, even without factoring in latent credit risks in the longer run. As the credit surge concurrently exacerbates a bank's asset quality, capital, and liquidity, major weakness in any of these interconnected areas could derail a bank. It's not yet apparent if the smaller banks could stand up under a distressed scenario of a run on deposits even if they may report good funding and liquidity ratios. While such a situation looks remote at present, we can't rule it out completely, should a bank in question suffer a substantial spike in credit losses. Such risks are particularly pertinent for many regional banks. Small banks that run into trouble may become ready targets of mergers and acquisitions by stronger players.